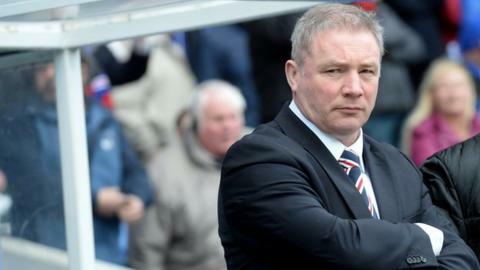 Ally McCoist admits he is concerned about the teams his Rangers side might face in the Scottish Championship next season. The Ibrox team coasted to the League One title this season to seal their place in the second tier. Hearts will join them after being relegated, with Hibernian among the clubs battling to avoid the Premiership's relegation play-off spot. "The prospect of a big club like Hibs coming down worries me," said McCoist. Hamilton are in pole position to secure promotion from the Championship, meaning Dundee, Falkirk and League One promotion hopefuls Dunfermline Athletic could also be in the second tier next season. "No-one has a God-given right to win games. I've already said it will be a hell of a competitive and interesting league," added the Rangers manager. "We don't know who will be coming down and there is a few twists and turns to come out of the next two or three weeks, which I'm looking forward to watching. "Hibs have been mentioned, but there are three or four of them down there fighting to avoid that play-off place, so it will make it really interesting for our league next year whoever plays in that play-off and ends up coming down." McCoist's side have recovered from losing both the Ramsdens Cup final to Raith Rovers and their Scottish Cup semi-final with Dundee United by recording back-to-back wins over Forfar Athletic and Stenhousemuir. However, with the club beset by off-field problems, the manager is keen to put the campaign behind him. "I'm looking forward to my holiday, if that's what you are asking me?" added McCoist. "But we've got three big games left and, even before that, a lot of planning to do for next season. We have to look at pre-season, squads, players - a lot of work is still to be done. "I wouldn't say it has been a wearing season - it's been testing, but that is what you expect being manager of Rangers. "It's been a tougher job than I imagined it would be on the day I took it, with everything that has happened. "We didn't have any idea it would lead to administration and liquidation, so from that angle, it has thrown up a lot more challenges than I thought it would initially. "But you just have to meet those challenges head on as best as you can and we have done that. I hope it's made me stronger for it." Rangers face Ayr United at Ibrox on Tuesday before chief executive Graham Wallace announces the findings of his 120-day review into the club's books. "I will have a cup of tea with Graham before the game and then definitely have a chat on Wednesday or Thursday," added McCoist. "But I'm not expecting a heads-up or sneak preview of the report. That's Graham's department and, when he's ready to tell us, we will all know."